Good News for the Bees and Us! Here is an email with good news about saving the bees. 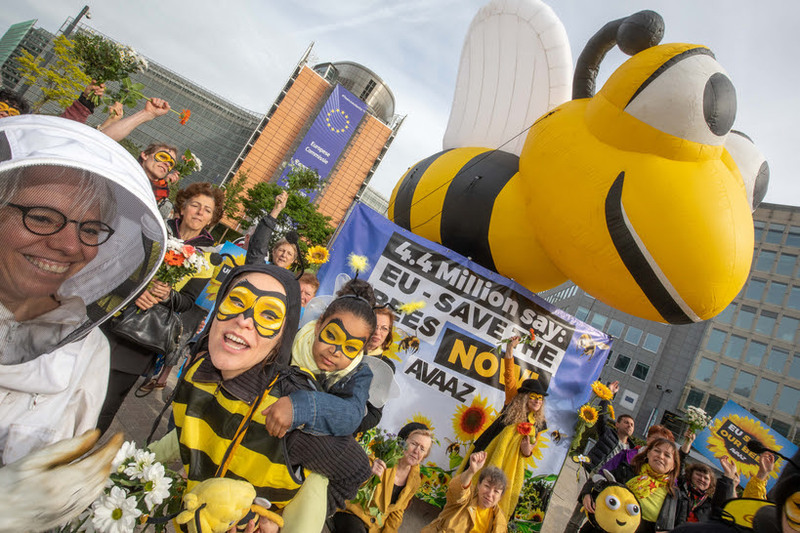 We just won a total ban on bee-killing pesticides in all 28 EU countries!!! This fight took 7 years and I am so, so proud of our movement right now! We’ve been cited in hundreds of articles the last few days with media calling Avaaz a “catalyst” of the outcome. And that outcome is MASSIVE. It’s not just a global tipping point to save the bees – it bans the world’s most common insecticides, pressing industry to develop a whole new model of non-toxic agriculture! We faced the biggest chemical corporations in the world and used every trick in the book – from a 5 million-strong petition, to crowdsourced funding for scientists, to tracking down ministers on an airport runway. 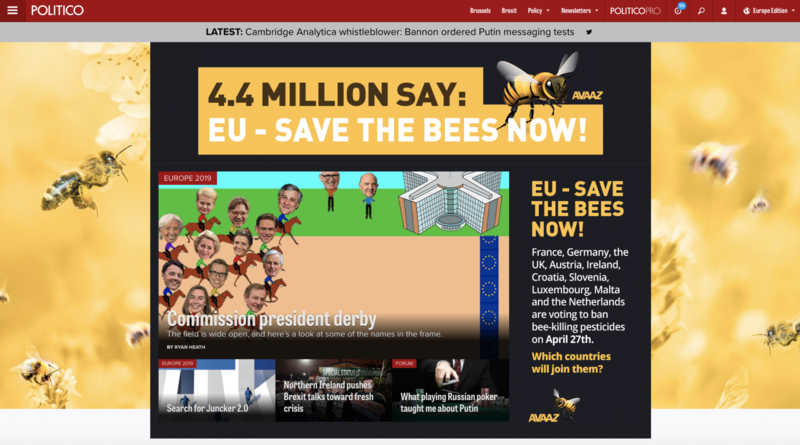 — over 5 million strong and delivered it with Avaaz’s 5 meter high mascot, Bernice, who has travelled the world to the key decision making moments, grabbing the media’s attention every time. …for seven years! 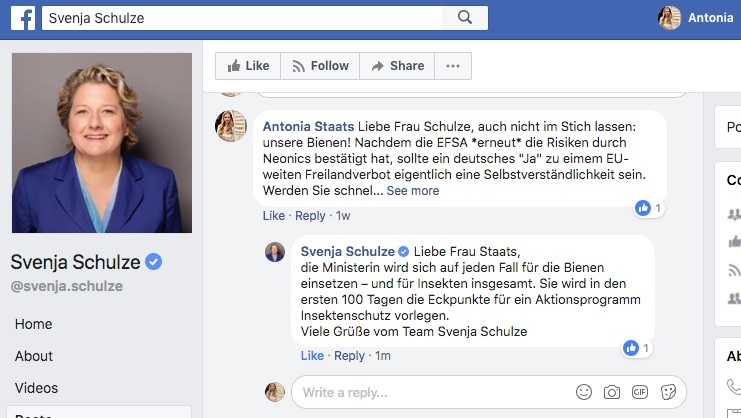 And in the last weeks, the push was so strong that, in Germany and Sweden, the ministers responded to us publicly on social media. And in Cyprus the Minister replied directly to Avaaz member Nicolas. The under-the-radar consultation was having a minimal response, then Avaaz members mobilized, and the count went from just 9,000 to 66,000 submissions in just four days, even crashing the system for a day!! To counter the many studies funded by the chemical companies, nearly 150,000 Avaazers worldwide have donated more than 2.5 million Euros (!!!) for bees campaigning and research! Together we supported seminal independent studies by top experts and made sure they were seen by key players before the vote. Finally the official EU scientific body, EFSA, came out supporting the ban. One of the key arguments to delay a vote was that farmers had no alternatives to these chemicals, and were anti-ban. 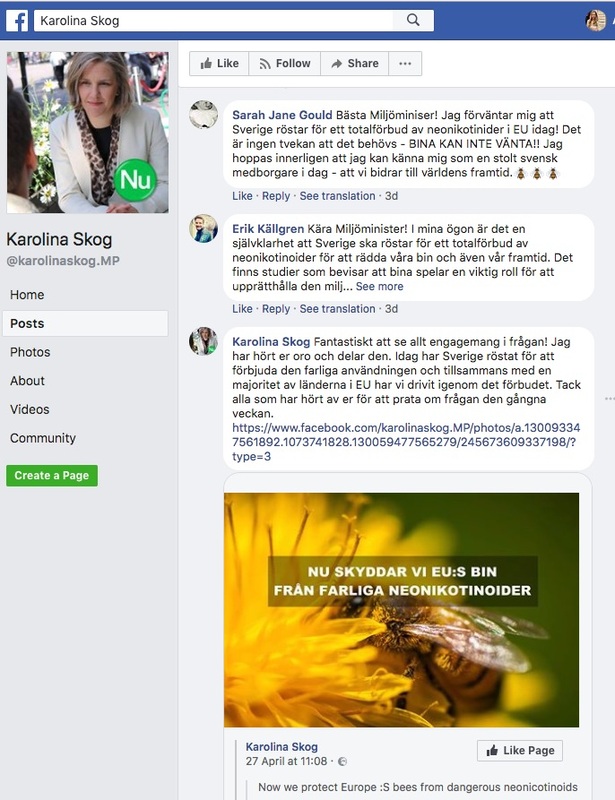 So Avaaz staff brought organic and conventional pro-ban farmers together behind an open letter that debunked that notion and published it across the EU — from La Libre in Belgium, to Dagens Nyheter in Sweden. Even Italy’s biggest farming union joined! Keeping the officials ambitious was key to winning the ban. 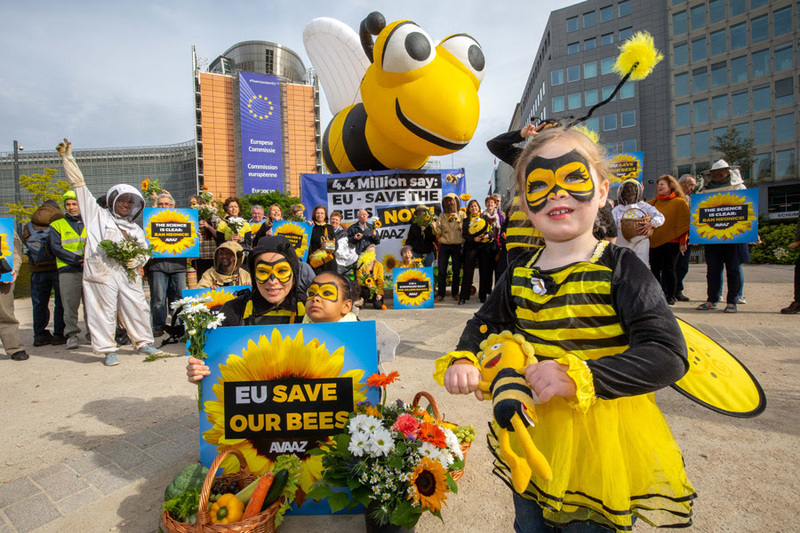 So when rumours emerged that the sugar industry was lobbying to water down the ban, we reminded European Commission President Juncker of his promise to be the “bee’s man“, delivered the campaign directly to Juncker’s cabinet, and blanketed a Brussels-based website with ads. And when the vote came in the Commissioner for health tweeted in celebration with Avaazers!! The campaign started in 2011, when one million Avaazers emboldened France to lead the way with their own ban. 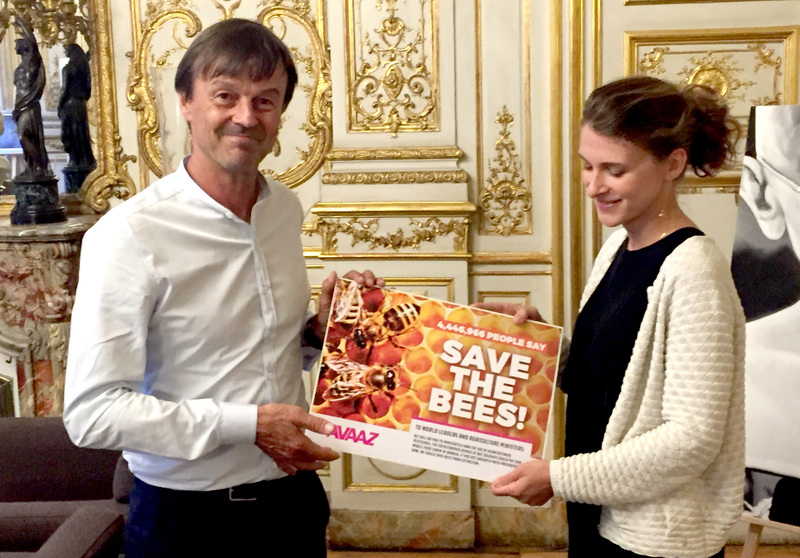 And we kept calling for France’s leadership government after government until Avaaz found a partner in French bee champion and Environment Minister Nicolas Hulot, who in this last stretch has been at the forefront of the EU-wide fight to ban neonics. Winning in Germany was our next battle! 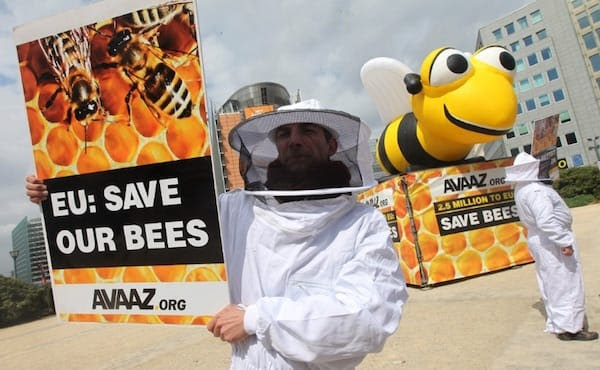 Over the years Avaazers have tirelessly delivered our call for a ban to three successive agriculture ministers! At one point the ministry had to set up a special email address because the volume was so high. In the final push, we ran an opinion poll that showed the ministers of agriculture and environment that voters from their parties were behind a ban, and it worked! Germany finally swung behind the ban! For years the UK was a blocker, with a former Environment Secretary even calling Avaazers’ messages a “cyber attack”. 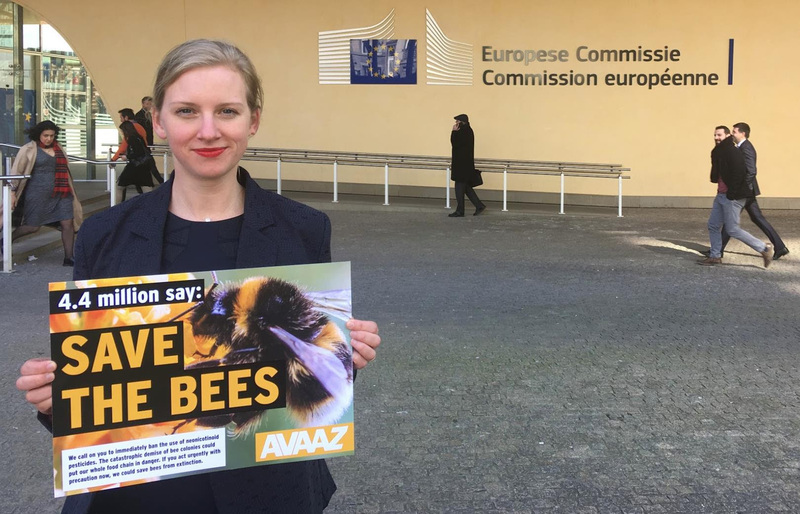 But last year, after Avaaz and partners supercharged national campaigning, the UK became a champion for the bees! The word was that no other topic had generated the same kind of correspondence to MPs by their constituents! And we spoke to politicians and officials day after day, right up to the very morning of the vote. In fact it was an Avaaz staffer that told a member of the Cabinet in Madrid that Spain had voted yes — we were so all over it we broke the news to him about his own government’s vote! 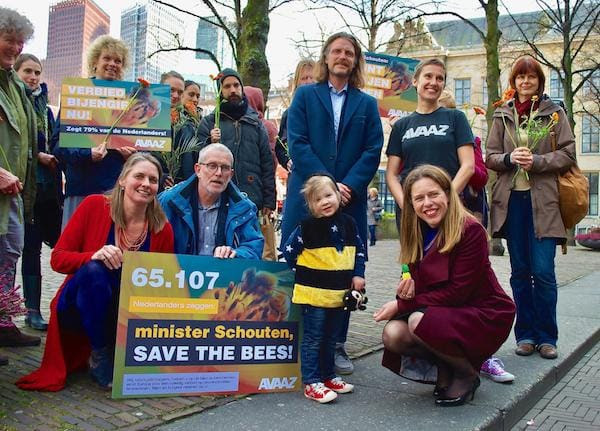 Just weeks before the vote, in the Netherlands three Avaaz members started their own national campaign to save the bees that quickly went viral, and was backed by 10 of the most prominent scientists in the country, two former ministers and even a princess! We then ran an opinion poll showing almost 80% of Dutch voters were behind a ban— and delivered the campaign directly to the country’s Agriculture minister. The minister took the petition board to “hang it up in the hallway”! Then, two days before the vote, the Netherlands came out in favour of a ban! 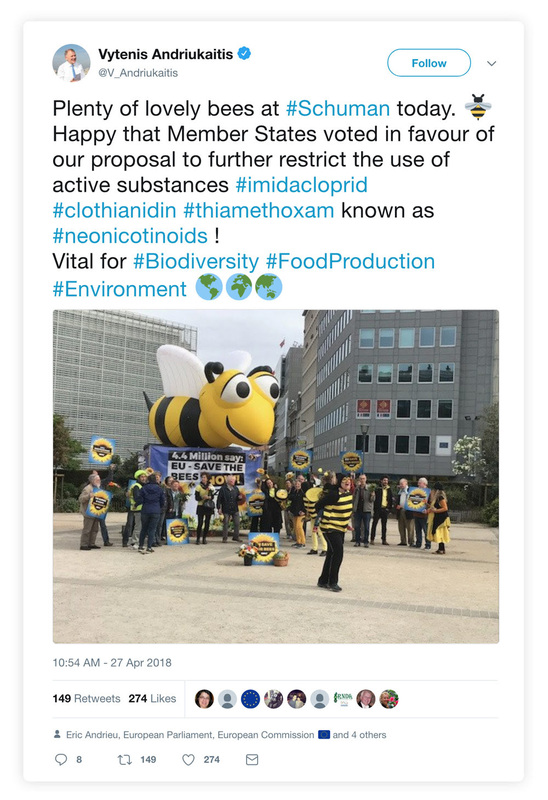 In Greece, we sent our massive petition to the Minister of Agriculture with organic honey made in his birthplace, and thousands of members sent him emails and tweets directly. Then, the day before the vote, we secured a front-page splash in the most widely read pro-government newspaper, and called everyone we knew, including the Vice Minister, to get the Minister on the phone. We finally reached him, hours before the vote, just as he was getting off a plane, and when he learned that the ban could depend on Greece – he immediately committed to supporting it! Only minutes before the vote, we knew we had 13 countries on board, but were still unsure we would win. When we heard almost all of our target countries had voted in favour Avaazers came out in droves in Brussels to celebrate. It’s been a massive effort for years to get this win. 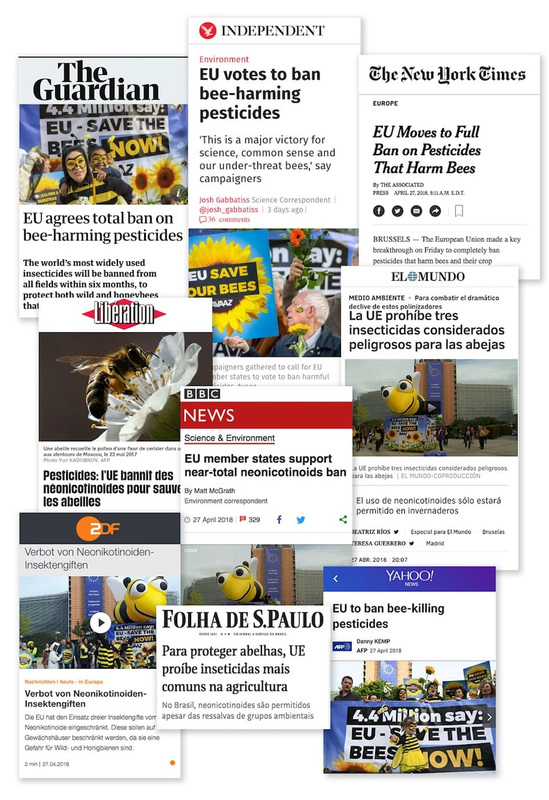 Partners like PAN, Greenpeace, Friends of the Earth and SumOfUs have campaigned hard alongside our community, and we’ve worked hand in hand with amazing scientists, beekeepers as well as key politicians and civil servants who championed this cause. Today, we celebrate together. This ban feels like a substantial shift from pesticide based intensive farming towards a new exciting model of agroecology, where food production happens in harmony with nature, not against it. But we cannot sit on our laurels now — we must bring this win to the US and Canada who will consider similar bans this year. 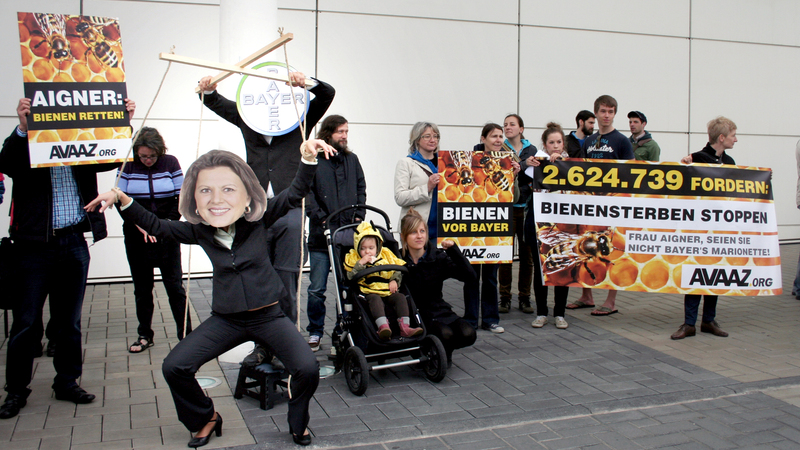 Plus we have to keep vigilant in Europe — Bayer and Syngenta have a dangerous legal challenge in the European Court of Justice! We have to keep fighting worldwide if we want to protect our land from desertification and our precious biodiversity from collapse. But our movement was built for this kind of fight… and this amazing campaign shows that if enough of us speak out together, and we are smart, we CAN get our governments to protect the public good. So thank you, thank you, thank you, and watch this space for the next call to action on the next battlefield! This entry was posted on Thursday, May 3rd, 2018 at 6:09 am	and is filed under Health Matters: Flashes & Reports, Home Page. You can follow any responses to this entry through the RSS 2.0 feed. You can skip to the end and leave a response. Pinging is currently not allowed. A start in the world ! !